Today, almost 26 million Americans — adults and children — have been diagnosed with diabetes. By 2025, that number is projected to rise to 438 million individuals around the world, which would be about 7.8% of the world’s adult population. Combating the rise of diabetes involves multifaceted strategies but promoting a healthy diet is one of the most effective ways of reducing the numbers of the disease. Two recent studies have shown that a common food source can aid in the fight against diabetes, suggesting that including almonds in the diet of a Type 2 diabetic can help to regulate blood sugar and cholesterol levels. The first study, published in the journal Metabolism, discovered that study participants, who had Type 2 diabetes, had a 30% decrease in their blood glucose levels after consuming a meal high in carbohydrates when they ate an ounce of almonds immediately before the meal. Those who did not have Type 2 diabetes showed a 7% decrease in blood glucose levels when they consumed the same amount of almonds and ate the same meal. The participants also fasted overnight and were then separated into two random groups; one group received a meal without almonds and the other group received a meal that included almonds. Among the Type 2 diabetics in the group that received the meal with almonds, blood sugar levels were shown to be reduced after the meal. A second, smaller pilot study was conducted with some of the same participants to determine whether regular almond consumption had an effect on blood sugar levels. Participants with Type 2 diabetes were randomly separated into two groups of six to seven subjects; one group ate an ounce of almonds five days a week for 12 weeks. The other group ate two cheese sticks at the same frequency and for the same time period. The almonds and cheese sticks were similar in nutritional properties: the almonds contained 163 calories, 0g carbohydrates, and 14g fat, while the cheese sticks had 160 calories, 0g carbohydrates, and 12g of fat. Other than the almonds and cheese sticks, the two groups ate a very similar diet. The study found that the group who regularly consumed almonds showed a 4% decrease in levels of hemoglobin A1c (HbA1c), which is a measure of blood sugar levels. They also showed a 4% reduction in body mass index, or BMI, over the group that ate cheese sticks for the period of the study. Another study published in the journal Diabetes Care discovered that nuts (such as almonds) helped Type 2 diabetics in maintaining healthy cholesterol and blood sugar levels in men and postmenopausal women. “Both of these studies further deepen our understanding of the benefits of almond consumption for those with Type 2 diabetes,” said Karen Lapsley, Ph.D. “Those with diabetes are faced with many challenges with their disease management, which is why we are always energized when new research is published that supports our understanding of almonds’ role in helping alleviate some of the difficulties.” Lapsley is also the Chief Science Officer for the Almond Board of California. 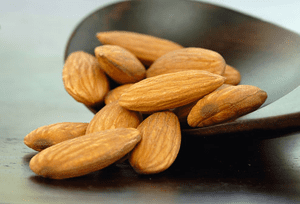 A one-ounce serving of almonds offers 3.5 grams of fiber, 13 grams of unsaturated fat and only 1 gram of saturated fat. The studies demonstrate that almonds make a healthy food choice for Type 2 diabetics, helping them to maintain blood glucose levels. The studies show that consumption of almonds provides benefits for Type 2 diabetics both in the long and short term, making them an excellent choice for anyone coping with diabetes. This entry was posted in Diabetes News on September 9, 2011 by admin.